We’d love your help. Let us know what’s wrong with this preview of Keep Quiet by Lisa Scottoline. When Jake Buckman decides to let Ryan, his sixteen-year-old son, practise driving home along a deserted street, he has no idea of the deadly consequences. But in the darkness of night, a runner comes from nowhere and the hit is fatal. Now Jake and Ryan have two options: admit Ryan's responsibility...or drive home as though nothing happened. What follows is not a clear-cut hi When Jake Buckman decides to let Ryan, his sixteen-year-old son, practise driving home along a deserted street, he has no idea of the deadly consequences. 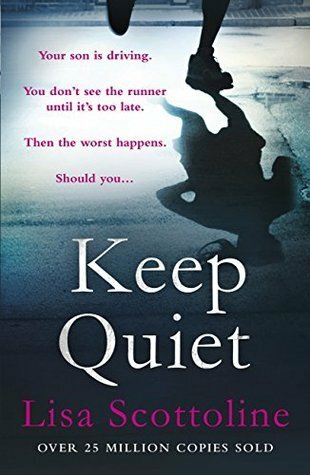 To ask other readers questions about Keep Quiet, please sign up. I'm reading Keep Quiet, and I'm enjoying it quite a bit. It's my first Lisa Scottaline book- which one or two of her other books would you guys recommend the most? Christina I would recommend Look Again! I really enjoyed it. Did I miss a piece in the ending ? Who killed the IT nerd? Wanting to get closer to his son Ryan, Jake Buckman unwisely lets the underage teen take the wheel of his Audi. Taking his eyes off the road for an instant Ryan hits and kills a female jogger. Wanting to protect Ryan - a good student and star basketball player with a promising future - Jake decides to leave the scene of the crime. This unfortunate decision has dire consequences. For one thing Ryan can't live with the lies and starts to fall apart. For another, it seems that someone might have witnessed the accident.....and may want to cash in. As events proceed Ryan's mother Pam, a local judge, is nominated to ascend to the federal bench. This requires a thorough investigation by the FBI and Jake fears that Ryan won't withstand the questioning. Jake desperately tries to 'fix' the situation but it spirals out of control and threatens to destroy the family. Events rush toward a dramatic resolution that's not quite believable. Still, the book is a page turner that imparts a good lesson: take responsibility for your actions. I flew through this book, it was so hard to put down. I had read a few reviews before hand where people had described it being hard to read. I didn't get it until I was into the book. While I loved it, it was hard to read. Besides the whole fact of the main plot, I found I didn't like very many of the characters and it was a little difficult to relate. It was hard not to be judgy because after all, as horrible as it was, who knows what we would do in that situation to protect our children. Every I flew through this book, it was so hard to put down. I had read a few reviews before hand where people had described it being hard to read. I didn't get it until I was into the book. While I loved it, it was hard to read. Besides the whole fact of the main plot, I found I didn't like very many of the characters and it was a little difficult to relate. It was hard not to be judgy because after all, as horrible as it was, who knows what we would do in that situation to protect our children. Everyone thinks they would do the right thing. But would they? And Pam just really annoyed me. She was such a nag, had to know everything including checking on the student portal constantly and knowing Ryan wasn't in class. When the truth about her relationship with Dr Dave came out, she had just found out about the accident, and while the focus was on that, she swept that whole part with Dave under the rug and was so judgemental with Jake. And then she was all for keeping it a secret so how did that make her any better? And then after being so nasty, the second the truth comes out about Dave, she all of a sudden wants to be married again, with babe and honey, when the day before, she wanted nothing to do with Jake. When Jake was needing to find the money for Andrew I had such a feeling of dread, that he would take it from gardenia. I didn't feel much better about him, I think he didn't take it because he wasn't able to, not because he knew it was wrong. I was concerned with the whole message Ryan was being given by hiding the truth. How could you live the rest of your life with what you did? How could you fault him in the future for any wrongdoing he did? While I know Jake made a spur of The moment decision that he thought he was doing to save his son, there were so many after affects. And how do you keep up with the lies? When Jake finds out that someone else knows, he gets in deeper trouble. The panic and helplessness he must have felt, but thought he had no choice but to give in to Andrews demands. He had to know that someone else knowing changed things drastically, it was never going away. I did suspect the real circumstances of the accident before it was revealed. Nonetheless, even though they weren't guilty of what they thought they were, the fact still remains that they didn't know that. It doesn't make them any less guilty morally. Here we have another fairly chunky book, full of promise, but let down by clunky writing, poor punctuation, horrid characters and as much padding as a Tog15 goose down duvet. The premise is good – Jake, wanting to rekindle a failing relationship with teenage son Ryan, allows him, against his better judgement, to drive his racy Audi. The fact that Ryan is not permitted to drive after eleven o' clock at night and it's a foggy, drizzly night, does not stop Jake agreeing. The worst happens – Ryan run Here we have another fairly chunky book, full of promise, but let down by clunky writing, poor punctuation, horrid characters and as much padding as a Tog15 goose down duvet. The premise is good – Jake, wanting to rekindle a failing relationship with teenage son Ryan, allows him, against his better judgement, to drive his racy Audi. The fact that Ryan is not permitted to drive after eleven o' clock at night and it's a foggy, drizzly night, does not stop Jake agreeing. The worst happens – Ryan runs over what he thinks is a deer; on closer examination it turns out to be a young jogger. Can things get any worse? Oh yes - Ryan has a bag of marijuana on him – he's smoked some earlier. Ryan wants to call the police, but Jake decides against this and so they concoct a story as they drive home, leaving the body on the road – as you do. Once home Ryan shuffles off to bed red-eyed from crying, which causes raised eyebrows from Pam, his mother, who immediately starts interrogating Jake – oh, forgot to mention one tiny detail: Pam happens to be a highly intelligent Judge (she even has the necessary “intelligent blue eyes" to prove it). Does this actually make the moral dilemma worse? The characters are so unsympathetic and unlikeable, I could have given them all a good slap. Pam has to know every little detail (and, apparently so do we) of every minute of every day; Ryan is a whingey-whiney six year old – ooops, sorry, sixteen year old - but maybe I was right the first time. And as for Jake, who does a lot of shuddering, going over and over and over, constantly thinking about what he's done, what he's doing, what he's going to do, what he should have done....aaaargh! Having read the blurb I was expecting a really good thriller, tightly written, full of tension; what I got was a lot of slushy stuff, Perfect All-American Family Endures Tragedy-Jodi-Picoult type thing. Every page is so overladen with irrelevant rubbish: the colour of filing cabinet, the names of all the shops lining a particular street – yes, really; I could list them all page by tortuous page. Absolutely nothing is left to draw you in,it's all there, laid bare as though the author doesn't trust her readers to use their imagination. I'm almost a third of the way in and already irritated by the style of writing: the book is absolutely stuffed with words – another author who thinks More is Better, and so full of annoying American phrases I'm cringing with every turn of the page. If I read once more of a car being “fed gas”, I'll hurl the book out the window. What is wrong with “accelerate”? Slang and teenage idioms are fine, sometimes necessary, but not in the narrative, which is far from “gripping” or “emotional”, unless you like families which are constantly hugging, sobbing and declaring love for each other. That Ryan “felt awful” at the thought of killing someone his own age, or Jake “felt awful” that he'd killed someone else's child just does not convey the dreadful situation. Awful? Come on Ms Scottoline, surely you can do better than this. Some bits of this actually had me laughing out loud, but for all the wrong reasons. This is the first of her books I have attempted - it will be the last. This had lots of good twists and turns but reading it was a little eerie as the plot line (leaving the scene of a hit-and-run and hiding it from the family) and theme (how far do you go to protect your children) were very similar to Carla Buckley's THE DEEPEST SECRET, and if they weren't published at about the same time of the year I would say one author would have a case for plagiarism. And even though it was the third book I've read this year about protecting your family by hiding a heinous ev This had lots of good twists and turns but reading it was a little eerie as the plot line (leaving the scene of a hit-and-run and hiding it from the family) and theme (how far do you go to protect your children) were very similar to Carla Buckley's THE DEEPEST SECRET, and if they weren't published at about the same time of the year I would say one author would have a case for plagiarism. And even though it was the third book I've read this year about protecting your family by hiding a heinous event (THE DINNER by Herman Koch was the other), it was well done and I had hard time putting it down. I'm such a fan of Scottoline but I almost didn't finish this book. It was repetitive and I figured out the ending about a third of the way through. On top of that, it was very depressing. A father, who had never been close to his teenage son, makes a decision that will change the lives of his whole family and several others, and then covers it up. The story is about the changes that take place in these people. An OK read but Scottoline has written much better. Estava com grandes expectativas neste livro e não me desiludiu. Agarrou-me de início e foi-me mantendo sempre interessada!! Gostei mesmo imenso, havia cada reviravolta!! revisto em 10/09/2015: Se pudesse daria 4,5* pelo entusiasmo com que o li. Accountant Jake Buckman had let his relationship with his sixteen year old son, Ryan go. He had let his wife, Pam, take over while he built up his accounting business. Pam was a state judge but she was the one to take the boy to his games, appointments and bond with him. They had been through marriage counseling and a product of that was that Jack was supposed to strengthen his ties with Ryan. Jake decided to be the one to pick up his son at the movies. Ryan, 6’5” and a varsity basketball player Accountant Jake Buckman had let his relationship with his sixteen year old son, Ryan go. He had let his wife, Pam, take over while he built up his accounting business. Pam was a state judge but she was the one to take the boy to his games, appointments and bond with him. They had been through marriage counseling and a product of that was that Jack was supposed to strengthen his ties with Ryan. Jake decided to be the one to pick up his son at the movies. Ryan, 6’5” and a varsity basketball player begged him to let him drive part of the way home. Ryan had a learner’s permit and was not allowed to drive late at night. His father, Jake relents out trying to gain favor with his son. At eleven at night and they were talking as Ryan makes a turn at a curve, he glances over at his dad and they both hear a thump. Jake gets out and finds that it was a woman who has been hit and despite his efforts to give CPR, it was too late, she was already dead. He keeps yelling for Ryan to call 911. Jake is in shock and keeps saying that he killed her, he killed her. He confesses to his father that he had been smoking pot with one of his friends. Jack realizes that his son’s life will be ruined, he won’t be able to go to college, get a good job if he calls the police. Ryan wants to accept responsibility and but his father insists them keeping what happened secret. That is how this tortuous story of guilt and panic starts. 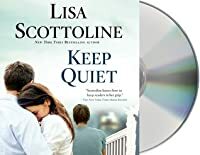 Keep Quiet by Lisa Scottoline starts with a little background and then plunges the reader in to the moral dilemmas raised by the accident. The whole book is intense and riveting. It deals with relationships, morality, guilt and a need for justice. It is plainly written and keeps you reading. After reading it, I was wanting to set aside a whole month just for reading Lisa Scottoline’s books. It was not complicated and only used as much flashbacks as needed. It causes you to try figure out what you would do if you were in the same situation. Would you protect your child no matter what or let him face the consequences of the law? It was very difficult to lay this book down. I highly recommend it to all readers who love family stories, mystery and suspense. I received this ARC as a win from FirstRead but that in no way influences my thoughts and feelings in this review. I won this book in a Goodreads giveaway, and I am so excited, happy, and thankful that I did. This novel was not only a quick read which held my attention, but also explored the deeper ties of family relationships. However, being that this book am advanced readers edition and NOT the final piece of work, there are a few things that could be taken into consideration for improvement. One thing that made me pause was the dialogue of the son early in the novel. At points it almost felt forced, like I won this book in a Goodreads giveaway, and I am so excited, happy, and thankful that I did. This novel was not only a quick read which held my attention, but also explored the deeper ties of family relationships. However, being that this book am advanced readers edition and NOT the final piece of work, there are a few things that could be taken into consideration for improvement. One thing that made me pause was the dialogue of the son early in the novel. At points it almost felt forced, like Scottoline was trying too hard to sound like a cool teenage boy. For me, this had the affect of making me question, "Boys don't really talk like this, do they?" Another thing was that the scene of the crash seemed very similar to that of a novel I recently read this past year by Barbara Delinsky. In Scottoline's book, the father let the son drive (who had smoked pot but wasn't high) and the son ended up killing a girl from school. Similarly, in Delinsky's book a mother lets her daughter (who drank a beer but wasn't drunk) drive home where she hit and killed a man she knew from school. However, once Scottoline had her characters try to cover up what they did, this novel really does take a step in a different and captivating direction. ---Page 62-63 reads "did you tell me had a hamburger last night?" Instead of "he had a hamburger." ---Page 92 reads"your father as legally more culpable than you." Instead of "your father is legally." ----Page 107 reads "They FBI wants" instead of "The FBI wants." ---Page 161 Jake is being blackmailed for 250k but on page 171 it says "He asked for $25,000." This can come off as a typo, but at the same time could be a lie Jake is telling his son in order to protect him from the full extent of the truth. ---Page 210 reads "she said yes and Ryan opened the door" but really Jake should be opening the door. Overall, I really enjoyed and felt myself to be deeply immersed by this novel. I will definitely recommend it for others to read once it is released! This is a very average story about a perfect family, that makes a terrible mistake and has to live with the consequences. Jake Buckman lets his son drive his car and this leads to an accident and a dead girl. Thrown into this mix is the rather dubious moral decision to just leave the scene, taken by Jake and then to lie and cover up. There is also a bit of blackmail and Jake discovering his perfect family isn’t so perfect. At the heart of the novel is the moral dilemma. What would you do if you w This is a very average story about a perfect family, that makes a terrible mistake and has to live with the consequences. Jake Buckman lets his son drive his car and this leads to an accident and a dead girl. Thrown into this mix is the rather dubious moral decision to just leave the scene, taken by Jake and then to lie and cover up. There is also a bit of blackmail and Jake discovering his perfect family isn’t so perfect. At the heart of the novel is the moral dilemma. What would you do if you were in Jake and Ryan’s situation? A road traffic accident with a victim lying dead in the road. Would you leave someone dead? Would you stop and get help? Would you do the right thing? I had multiple issues, when reading this. Firstly none of the characters were likeable or that interesting. Jake overly analysed everything and then behaved like he was hard done by, when he wasn’t getting away with it. Jake and his wife Pam treated their sixteen year old son like he was a small child. He is old enough to drive after all, yet he is followed around by his parents like he is under ten. I couldn’t believe in the relationship and the way they were happily letting him get away with murder, so he could go to university. The son, Ryan, was rather one dimensional and reverted to small child behaviour quickly as the guilt settled in. It was pretty obvious he would not cope with multiple lies. I lost all sympathy for him. And Pam, the mother, why was she forever checking up on everyone and moaning at them? She was just so controlling. This was a little too ‘perfect American family has a little setback’. As a thriller, it is pretty weak and the characters just seemed a little one dimensional for me. We saw progression in the relationship between Jake and Ryan, but I could not believe in them. This is a book I am glad to put down. A quick read for me, this was an intriguing enough story but for some reason was not really hitting the mark for me on several levels. The premise is an interesting one – how far would you go to protect your children? Jake takes a fast decision to try and cover up a terrible accident in order to protect his son’s future – but keeping this secret is far from easy as Ryan falls apart and the tangled web gets ever more invasive. What I did like about this one was the moral choices, how the characters A quick read for me, this was an intriguing enough story but for some reason was not really hitting the mark for me on several levels. What I did like about this one was the moral choices, how the characters handled them, for the most part this was done really well, with perhaps slightly too much unrealistic angst, but generally speaking gives you pause for thought on what you might do in this situation. The relationship between Jake and Ryan is well drawn for the most part and you can easily get emotionally involved with them. What I was not so fond of was Ryan’s Mum Pam. A bit too caricature for me, also I got a bit too tangled up in the twists and turns of the tale which led to what was, for me, a rather improbable ending. Ultimately I would say this is a solid 3* read and I think fans of Jodi Picoult would like it a lot more than I did – as it was, for this reader it was an enjoyable but not mind blowing moral dilemma tale. Wow. I am very tempted to only give this 2 stars so maybe it should be 2.5 stars. I listened to this on Audible and it was read by Ron Livingston (Office Space) so he is the image I had of the dad (which was actually kind of fitting). I know the purpose of this book was to purely entertain - but I swear the more historical fiction I read, the less I like pure fiction. I want to take away something after reading a book - and this book was so unbelievable and so un-real that what I took away from Wow. I am very tempted to only give this 2 stars so maybe it should be 2.5 stars. I listened to this on Audible and it was read by Ron Livingston (Office Space) so he is the image I had of the dad (which was actually kind of fitting). I know the purpose of this book was to purely entertain - but I swear the more historical fiction I read, the less I like pure fiction. I want to take away something after reading a book - and this book was so unbelievable and so un-real that what I took away from it was frustration. I have no problem quitting a book 1/2 way but this book had so many twists and turns that is would have been impossible to just skip to the end because it wouldn't have made sense. Therefore, I had to actually read this book in its entirety (ok, I did skip a bunch) and that just pisses me off. Ha! Terrible. Was looking for a quick beach read, something easy and simple. This was too easy and simple. The characters were not well developed, the dialogue not believable, and I could not stand the wife (who I think was supposed to be a *good* character). Because I disliked this character so much, it made me dislike all of the interactions w her family and the way they viewed/worshipped her. 2 stars instead of 1 because it made me think, once or twice, 'what would I do in a similar situation?'. Well...I found this book to be just okay. It was one of those reads that I felt compelled to finish because I wanted to know how it ends. I was initially drawn to it because of the description but it was one of those books that sounded better than it actually was. On the one hand, it had moments when I was glued to the pages but there were also times when the plot droned on or felt contrived. The book revolves around the following dilemma: As a parent, to what lengths would you go to protect you Well...I found this book to be just okay. It was one of those reads that I felt compelled to finish because I wanted to know how it ends. I was initially drawn to it because of the description but it was one of those books that sounded better than it actually was. On the one hand, it had moments when I was glued to the pages but there were also times when the plot droned on or felt contrived. The book revolves around the following dilemma: As a parent, to what lengths would you go to protect your child? Would you break the law to protect your child even if it meant having to live a terrible lie for the rest of your life? The book follows the aftermath of Jake's decision to do just that. In a moment of trying to be "fun dad," Jake allows his son Ryan to drive the car one night despite it being outside of the regulated learner's permit hours. In a second of sudden tragedy, Ryan hits and kills a person. Jake's decision-making becomes even more desperate when he learns that Ryan may also be impaired. He realizes this accident could erase his son's promising future and land him in jail. He feels responsible and wants to protect his son. The plot delves into the emotional impact of living with a lie of this magnitude and the catastrophic down slide of normalcy. About half way through, the plot takes an unexpected turn and becomes more of a thriller than character driven drama. I felt the story picked up at this point and was much more engaging. There were a few twists that kept me going and keen to get to the end. I have to admit, I was very curious to know how the author would end this story. It seemed like a difficult plot line to resolve. However I was a little disappointed with the ending. Again, it felt contrived and rushed - as though the author suddenly realized she needed to FINISH THIS BOOK RIGHT NOW...I think I may have rated the book higher had the ending been better. Ryan and his dad, Jake were not particularly close and although he loved his son dearly he somewhat resented the closeness he shared with his mom, Pam his wife. At his wife's suggestion he goes to pick up Ryan at the movies. Jake is driving him home when Ryan asks if he could drive the rest of the way. Knowing he has a permit and cannot drive at night Jake figures they are less then five minutes from home and he is in the car with him, so why not??? Maybe Ryan would actually think of his dad as c Ryan and his dad, Jake were not particularly close and although he loved his son dearly he somewhat resented the closeness he shared with his mom, Pam his wife. At his wife's suggestion he goes to pick up Ryan at the movies. Jake is driving him home when Ryan asks if he could drive the rest of the way. Knowing he has a permit and cannot drive at night Jake figures they are less then five minutes from home and he is in the car with him, so why not??? Maybe Ryan would actually think of his dad as cool. How in less then the blinks of an eye will there families lives change forever? When a tragic accident occurs, Jake makes a quick decision and cannot look back. How can Jake tell his wife? Would Ryan be able to live with this secret? Jake decides he will take the blame and not involve his son or there would be no college scholarship and possibly a criminal record that would follow him forever and his life would be ruined. Pam, his wife is a judge and she knew right from wrong so how would they make this work? While deciding on what they should do Jake uncovers a shocking surprise about his wife that could tear their marriage apart. Is it possible to forgive, forget and possibly start over? This is my first time reading a book from Lisa Scottoline and I am impressed! This book follows a man named Jake and his son Ryan and they are out one night, and Jake lets Ryan drive even though he's underage and unlicensed, and while driving Ryan hits and kills a woman who's on a run. In a moment of panic and thinking about how this would affect Ryan's future, they flee the scene of the accident. We get to watch as this hit and run incident starts to consume their lives and lying to everyone about what they did starts to weigh on their conscience. This story had a lot going on and I was surprised by the amount of plot twists and how many times they were almost caught. It was very exiting to read about, and I enjoyed the father/son relationship between Jake and Ryan. This book is very easy to read, and I listened to the audiobook and I thought the audiobook was great, I loved the narrator's voice and he really brought these characters to life. Valeu somente pelo final que tem uma reviravolta! A little slow in developing and I was overwhelmed by the initial situation. However, true to the skill of Lisa Scottoline's ability to write - I was soon "hooked". A book to discuss - deals with right and wrong, standards of moral, and ultimately the love for your child and family. Begs the question . . . just how far would you go to protect a loved one? Scottoline has done it again! I have read a lot of this author’s books which I find quite enjoyable. This book takes a turn on what the author usually writes. Instead of focusing on the women in the book she is basing the story around the male. The story is about Jake, Pam and Ryan. Pam wants Jake to pick Ryan up from the movies since father/son haven't been getting along and Pam is hoping that they can bond. While on their way home, Jake lets Ryan get behind the wheel thinking that this will be a bonding experience but lit I have read a lot of this author’s books which I find quite enjoyable. This book takes a turn on what the author usually writes. Instead of focusing on the women in the book she is basing the story around the male. The story is about Jake, Pam and Ryan. Pam wants Jake to pick Ryan up from the movies since father/son haven't been getting along and Pam is hoping that they can bond. While on their way home, Jake lets Ryan get behind the wheel thinking that this will be a bonding experience but little did they know the outcome of the night. Ryan hits someone and while they are trying to revive the person Ryan tells his father that he has weed in his pocket which starts the deception. How far will a parent go to protect a child and this is the author’s intent of the story. You will question yourself all through the book until the end on whether the father did the right thing. While reading the book would I do the same thing as what Jake did, probably because parents will do anything to protect their children. Every time Jake took care of a problem things just got worse. I didn’t figure out the whole book but I did figure part of the book out which helped Jake and his family in the end. I can honestly say I didn't not see the ending coming. I was going through my books and came across this one. It has been a while since I have read anything by Lisa. So I decided to pick this book up and start reading it. Wow. I knew Lisa could write but I did not expect to like this book as much as I did. I hate to say this but if it was not for the terrible event that brought Jake and Ryan together, I probably would have not found the family that interesting. It is because of this event that bonded the whole family and brought out the fighter in e I was going through my books and came across this one. It has been a while since I have read anything by Lisa. So I decided to pick this book up and start reading it. Wow. I knew Lisa could write but I did not expect to like this book as much as I did. I have mixed feelings about reading this book. In the beginning I found it slow and difficult to read. Jake loves his 16 year old son Ryan but has a strained relationship with him so at his wife's urging, he goes to pick up Ryan from the movies. He makes two poor decisions that night. At Ryan's urging, Jake allows him to drive even though with a driver's permit Ryan should not be driving that late at night. Jake allows his because as he later says "I wanted to be a buddy more than a parent." A tr I have mixed feelings about reading this book. In the beginning I found it slow and difficult to read. Jake loves his 16 year old son Ryan but has a strained relationship with him so at his wife's urging, he goes to pick up Ryan from the movies. He makes two poor decisions that night. At Ryan's urging, Jake allows him to drive even though with a driver's permit Ryan should not be driving that late at night. Jake allows his because as he later says "I wanted to be a buddy more than a parent." A tragedy occurs and Jake decides to keep it a secret to protect Ryan. Ryan wants to go to the police but Jake is adamant about not telling the police. In the beginning it was a lot of Jake saying he was worried about Ryan and Ryan saying he was worried about his dad. This was one of those books where you don't see it coming. I stayed at the edge my seat the whole time, from the very beginning. I am now hooked on Scottoline's books. I highly recommend them if you like a little suspense. Well...just try to put it down is all I can say. I am not a suspense person. I am a "life is scary enough" person but I had read Lisa Scottoline's non-fiction and loved it so I wanted to read the type of book she is most renowned for. I don't want to say anything that gives anything away. It was a great story. The scenario of how things began was a little too realistic when you have kids that age which is what made it so suspenseful. It feels like what happened at the beginning of the book could Well...just try to put it down is all I can say. I am not a suspense person. I am a "life is scary enough" person but I had read Lisa Scottoline's non-fiction and loved it so I wanted to read the type of book she is most renowned for. I don't want to say anything that gives anything away. It was a great story. The scenario of how things began was a little too realistic when you have kids that age which is what made it so suspenseful. It feels like what happened at the beginning of the book could happen. The story brings up the interesting point of how concerned we are with our kids' futures to the exclusion of what is actually happening in the present. Is what we imagine we want for their future more important than anything that's going on right now? But beyond that, it was just an incredibly suspenseful story that you just can't put down. Thank you so much to Good Reads First Reads for a free copy of this book. I loved it and it was a great opportunity to read Lisa Scottoline's fiction for the first time. I will definitely read more.